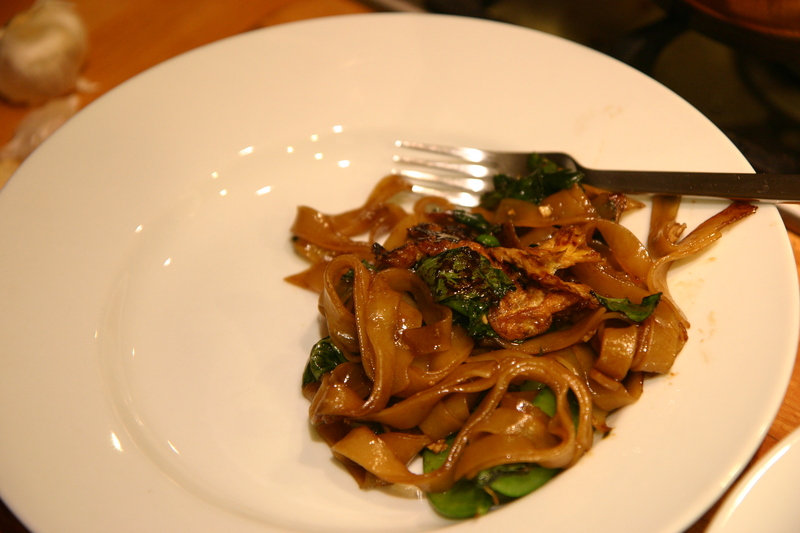 I love pad see ew at most Thai restaurants, and wanted to learn how to cook a reasonable version at home. I found some recipes on the Internet, but nothing seemed to give good instructions for my cooking style. I was inspired by a recipe on shesimmers.com, with a great video that shows how they make it a restaurant. It seems some of the instructions don’t quite match up with the video, but that’s not that big of a deal. 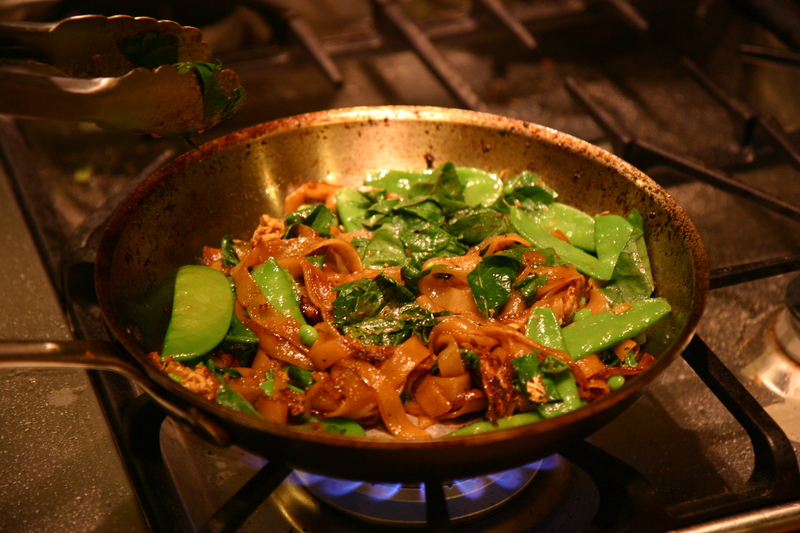 Here’s my interpretation for how to make Pad See Ew in a home kitchen. As SheSimmers mentions, a really hot stove is key. So far, I haven’t been able to get a good char on my noodles, possibly because I’m adding too much sauce and it tends to boil off (loosing heat at the same time). I also don’t have a wok yet, so maybe someday the recipe will improve even more. Cook noodles: Drop them into warm water for 30 minutes or until pliable. I’ve seen other methods, so I’m still refining this so we don’t get any overcooked or underdone noodles. Cook meat in stir-fry pan or dip in boiling water to cook. Prepare “special sauce” and have all ingredients ready and still hot! Hot ingredients will ensure that the pan temperature stays hot when the noodles go in. With your largest burner on as high as it will go, get your pan really, really hot. Add 2 T oil to pan and wait for it to start smoking. No need for nonstick. Add noodles (stand back). Don’t stir too much. Add 1 T dark soy sauce. stir it in and then let the noodles sit and try to get a char on some of them. Add Veggies and optional meat, stir with tongs, but let the noodles sit to brown a bit. Plate the dish when it looks done- perhaps 2-4 minutes? Make multiple batches separately to ensure pan stays hot.